This week in the back of beyond, young Master Vander-Cave has been doing his year 6 SATS. As a active 'out-doorsy' child, sitting still long enough to complete an hour long exam paper is like asking me to walk past a shoe shop with the word "Sale" in window and not stop for just a little looky loo...It's just not natural!!! So Master V-C's reaction to this enforced incarceration is to be extremely grumpy and stomp around like a bear with a sore head every evening. This is no fun for Mr V-C and so yesterday I decided to try and make something to turn his frown upside down. I figured sugar in extreme quantities would either cheer him up or make him hyper. Fingers were crossed for the former not the latter, particularly as he had cricket training in the evening and would need to concentrate for at least some of the session! I had been looking at the Hummingbird bakery Marshmallow cupcake recipe off and on since I got the book at Christmas but hadn't got round to giving it a whirl, particularly because with my recent attempts at healthy eating/baking I kept moving swiftly past it in search of healthier cupcake options. 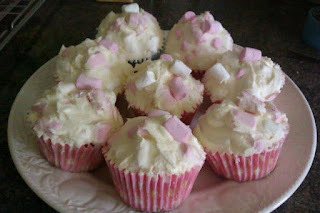 As this baking session was for Master V-C I figured it was time to try melted marshmallows and marshmallow frosting. I have tweaked this recipe slightly after making them. Firstly I find that most Hummingbird cupcake recipes make only 11 cupcakes not 12, secondly I found that I had quite a lot of melted marshmallow mixture left so I have reduced the quantity of marshmallows for melting and I reduced the amount of marshmallows in the frosting too as I was unable to get the original quantity mixed into the frosting. Preheat the oven to 170°C (325°F) gas 3. Put the flour, sugar, baking powder, salt and butter in a freestanding electric mixer with a paddle attachment (or use a handheld electric whisk) and beat on slow speed until you get a sandy consistency and everything is combined. Gradually pour in half the milk and beat until the milk is just incorporated. Whisk the egg, vanilla extract and remaining milk together in a separate bowl for a few seconds, then pour into the flour mixture and continue beating until just incorporated (scrape any unmixed ingredients from the side of the bowl with a rubber spatula). Continue mixing for a couple more minutes until the mixture is smooth. Do not overmix. Spoon the mixture into the paper cases until two-thirds full and bake in the preheated oven for 20–25 minutes, or until light golden and the sponge bounces back when touched. A skewer inserted in the centre should come out clean. Leave the cupcakes to cool slightly in the tray before turning out onto a wire cooling rack to cool completely. Put the medium marshmallows in a heatproof bowl over a pan of simmering water. Leave until melted and smooth. When the cupcakes are cold, hollow out a small section in the centre of each one and fill with a dollop of melted marshmallow. I always replace the cake lid on top of the melted marshmallow. Leave to cool. Stir the mini marshmallows into the vanilla frosting by hand until evenly dispersed and spoon the frosting on top of the cupcakes. These sound divine. When you pour the melted marshmallow into the cakes, does it set firm? Or does it stay a little gooey? Herman the Bloomin German cake!